Double Dutch Timing | Where in the World Are Our Kids? Tick, tick, tick, tick. The ropes rhythmically drummed against the pavement. There weren’t many sports that I was good at as a kid. But I did love to jump rope, especially double dutch jump rope. Downtown Atkinson Nebraska, as it looks from near where my house was. Every day of 4th grade recess, you’d find me jumping rope on the sidewalk of Atkinson Elementary school with Trixy, Amy, Trisha, and Janelle. Boys were not allowed. That would just be gross. In spite of the fact that jumping required coordination, I was actually pretty good at it –after a few hours of practice. But jumping wasn’t the only difficult part of double dutch jumprope, the ability of the rope turners to swing the rope in a timely manner was critical. If they had poor rhythm, or didn’t come in on time, there was no way for the jumper to jump. Again, because this required coordination, it took practice and effort to achieve. The hardest part of double dutch jump rope wasn’t the jumping, or the turning. It was getting into the spinning ropes. I had to wait for just the right moment, while the far rope was cresting at the top, to jump into the whirling ropes. Miss it by a fraction of a second, the ropes tangled around my feet, and my turn was over. Thirty years later, I can still vividly envision the sound of the ropes rhythmically hitting the pavement, the ropes cresting, waiting for the perfect moment to jump. Becoming a missionary is similar. Knowing when to jump is critical. Until I was knee-deep in the process, I never knew how much work it took to become a missionary. We have courses we need to take, both online and in person, immigration issues to address for our three different nationalities, speaking engagements every weekend, preparing to our house for sale, completing Rosetta Stone, deciding what to keep, give away, or take with us, determining where to go to language school and how we’re going to live while doing so, determining an educational plan for our children, and on and on. And then there is the matter of raising $102,000/year in pledges for the next four years, as well as a startup fund (or approximately $440,000 total). Getting to the mission field is a lot of work, before we can even get there. We had been managing to have Ken work full time on getting us to the mission field (unpaid) by dipping into our savings a bit each month. We pressed hard to get through the application, orientation, vision trip, fundraising training, and initial partnership building as fast as possible. I believe we may have even set a record for getting through the process. We knew we cannot be paid for our work getting to the mission field until we are at 50% funding. We are at almost 20%. And our savings just ran out. We find ourselves staring at the ropes of making it to the mission field. Ken has gotten a job at Chick-Fil-A, because he cannot take a pastoral position since we travel every weekend. He has gotten a job because we are not yet at 50% funding. But getting to 50% funding just got immeasurably more difficult because Ken is working full time, and I’m working my usual 80+ hours per week. Neither of us have paid vacation time. We certainly don’t mind hard work. We rather enjoy working hard. But we cannot get to the mission field without devoting many hours of work each week to get there, and we are out of time, and money. So we’ve come to the point where we need God to show up in a big way. We are spent. And at the end of ourselves is usually when God shows up. We are confident that God didn’t just call us to GO to the mission field in Ghana. He has called others to SEND us. God never issues a call without the means to fulfill it. 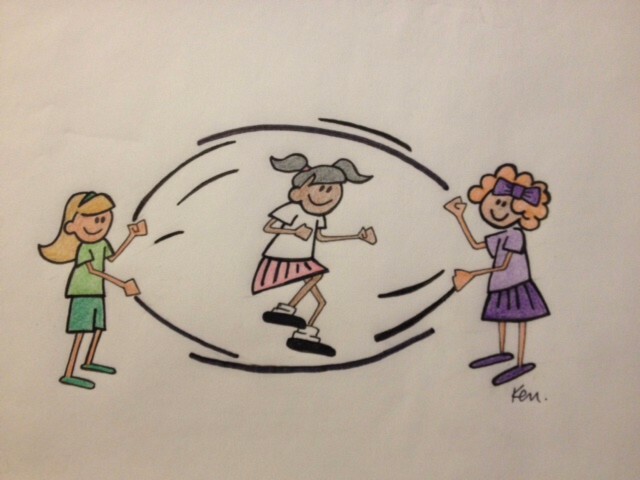 In the game of missionary double dutch jump rope, we are waiting for our time to jump in. We have committed our lives and possessions for the sake of the Gospel in Ghana. We are looking for some consistent rope swingers who are committed to invest in what God is doing in Ghana as well. Without the commitment and work of both the rope swingers and the jumpers, we’ll never get to the mission field. Many of you have asked when you should start giving. The answer is simple: Now. Once we get to 50% funding, Ken will be able to go back to full-time preparation for the mission field. The need is urgent, both here, and in Ghana. We know that the call on your life is every bit as important as the call on ours. We know you don’t know exactly how you’re going to do it. That’s okay. We know precisely how it feels to depend on God for money we just don’t have. We all know a God who has the resources. If you are ready to get in the game, and swing some ropes, click here.